WHITEHALL has responded to demands for the Royal Navy to be used to bodyguard British fishermen from violent French fishers after a ‘scallop war’ erupted in the Channel. French and British fishers clashed in a fight over scallops - with French boats being accused of throwing smoke bombs and stones at English and Scottish vessels. It comes amid a row that scallop stocks have been stripped by British firms, without giving the population a chance to recover. Dramatic footage of the incident was broadcast by France 3 Normandie, which showed the boats colliding as an object was hurled towards them. The latest fight at sea left British vessels visibly scarred, with some having reportedly limped back into the safety of UK harbours. Calls have since been made for the Royal Navy to be deployed to protect Britain’s merchant fleet from more attacks. Portsmouth is home to the Senior Service’s fishery protection squadron, which patrols UK waters enforcing maritime law. The Department for Environment, Food and Rural Affairs (Defra) would be the one that authorises any use of the navy to protect British fishermen. In a statement to The News, the government said it was ‘aware’ of aggression directed towards UK fishing vessels in the Channel ‘not under UK control’. However, defending the British fishermen, Whitehall insisted they were ‘operating in an area they are legally entitled to fish’. 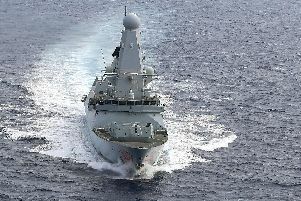 Responding to the calls for additional protection, a spokeswoman said: ‘The safety of the UK fleet is our highest priority, and we will continue to monitor the presence and activities of vessels in the area. Tensions originally sparked after negotiations between UK and French scallop industries, to secure a new fishing agreement, broke down. The deal sought to ensure British vessels measuring 15 metres and over could not enter closed French fishing waters in exchange for an annual allocation of days at sea. The French, on the other hand, are prohibited from fishing in that area due to domestic and environmental rules. Violence had previously erupted in 2012 when British and French fishermen clashed over the rights to fish scallops in the area. On this occasion, it prompted calls for the British to send the navy – but this went unanswered. Dimitri Rogoff, head of a Normandy fishermen's association, said the violent scenes demonstrated ‘the exasperation’ of Normandy fishermen in a situation which persists and does not change.